With Edraw Organizational Chart, you can create clear and comprehensive business organizational charts (or business organization structures) with no prior experience. As you can see by studying the sample organizational chart below, these types of charts are the ideal way to illustrate the inner structure and hierarchy of a business or any other type of organization. We offer lots of organization chart examples created by Edraw Organizational Chart Software, including company organizational chart, service organizational chart, sales organizational chart, market organizational chart etc. 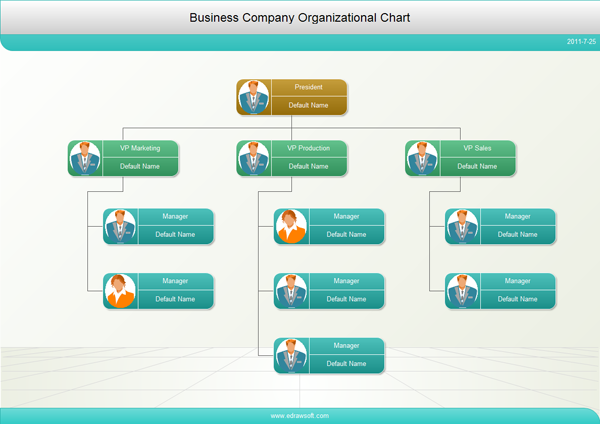 Perfect Business Organizational Chart Examples Created by Edraw! Nothing is left unclear when structural relationships are illustrated with an organizational chart created by Edraw - the ultimate organizational chart software. Use it to create organizational chart, visualize business organizational chart, sales organizational chart, market organizational chart, manufacturing organization chart, agency organization chart, bank organization chart, corporate organizational chart etc. As long as you have access to the Internet, you can sync for exclusive contents in addition to more organization chart examples. If there is any upgrade available, you will get pop-up notice once you start Edraw. And you can also check for update anytime within the software. Click Help tab and then click Check for Updates.